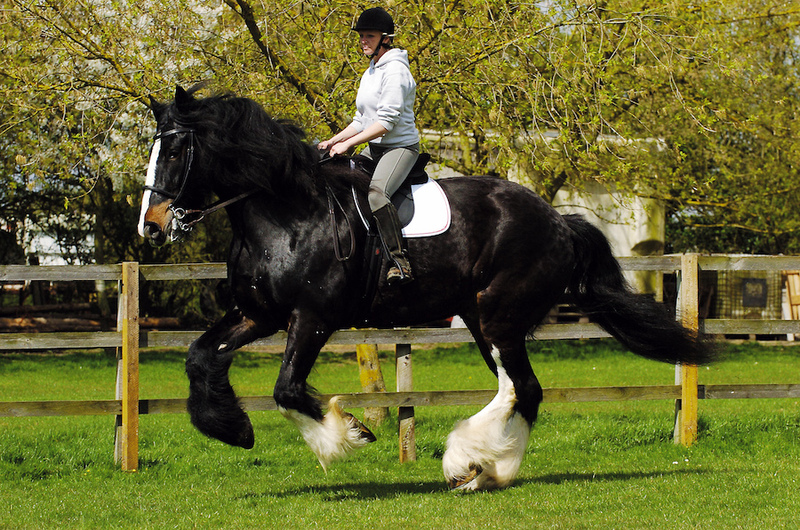 The Shire horse is an immensely beautiful horse of great height and strength. The Shire should stand from 17.2hh upwards and weigh in the region of around 2,000/2,500lbs. Although being an immensely strong horse is also a very gentle animal. Heavy horses in general are often termed the “gentle giant” which is very true. Shire horses are renowned for the hair on the lower leg this hair is called feather, another British breed of heavy horse also has this feather and that is the Clydesdale, a Scottish heavy horse. The Shire horse also known as the Great horse was used in medieval times and was bred from crossing a large native horse with larger heavier horses from the continent, in particular from Flanders and Holland. wore chain mail armour or plate armour to protect itself in battle. This is where we get the term the Great horse or War horse. ideally suited to agricultural work and haulage. This is what they are most recognised as today. In 1878 the English cart horse society was formed and this over the years then changed into the shire horse society. dressage and vaulting, showing that they are truly a very versatile horse. A smaller amount these days are still used in agriculture, and dray horses, others are used in forestry and going back to the medieval period, taking part in jousting tournaments. A truly magnificent sight to see. And most definitely part of England’s heritage. a horse called Crisp’s Horse of Ufford, who was foaled in 1768.
its solid appearance and strength. The Suffolk Punch is always Chestnut in colour, although the colour is traditionally spelled “chestnut". almost disappeared completely. Although the breed's status is listed as critical by the UK by the Rare Breed Survival Trust. Mechanisation and the need for food production in the Second World War was to blame for decline in the breed with huge numbers of horses going to slaughter, the Suffolk was on the brink of extinction until new breeders came along to help keep the breed going.To date the Suffolk is still the rarest of the heavy horse breeds, but thanks to ever more breeders and the Suffolk Punch Trust and Society the breed continues to grow steadily. temperament and good nature. They stand between 16 and 19hh and are born black with some staying black and others turning grey as they age and change coats with the seasons. Percheron's were one of the horses particularly used in medieval times carrying knights into battle and also weapons of war onto the battlefields. When the Percheron came to Britain the British army saw great quality’s within the breed and purchased a quantity which were then shipped out to South Africa and used in the Boer War. After the war horses that returned were then used in agriculture. Today the Percheron is a breed that is used more world wide then any other heavy horse breed, especially in Canada and the USA, where a very large population of this breed exists as well as the cross breeds from them. In Britain the Percheron is still used with some for agriculture and for demonstrations as well as forestry, They are also popular in the show ring weather in hand, driven or ridden, and going back to medieval times make fearless jousting horses. The Belgian Trekpaard or Belgian Draft horse is characterised by its amazing strong bulky body, it has a very heavy and powerful muscular frame and a large broad head she is a beautiful colour known as Blue mold which means she has black hair that grows between white hair and has an abundance of black hair on the lower legs known as feather. These strong short coupled powerful horses make for great harness work and are known for the horse being used in the sea to pull muscles and cockles out of the water. Moose before arriving here at the centre had been used as a logging horse in Holland before coming to the uk at the age of 5. Moose as you can see has what is called a dock tail, this is illegal to do in this country but was once used by most working horses as it kept the tail from getting caught up in machinery whilst the horse worked.